Travel back in time to Transylvania on a horseback tour through mysterious Romania. Gallop across vast green fields while weaving in and out of hay stacks, climb steep mountains for breathtaking views and experience the incredible history of Romania on a horse riding holiday. Experience ancient monasteries, organic and local produce, shepherds who spend their days in fields and a dark sky scattered with stars. On a Romanian horse you will find it all! 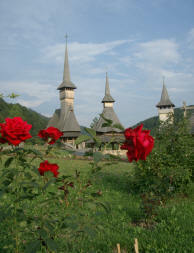 Romania is perhaps most famous throughout the world for Transylvania – the home of Bram Stoker’s Dracula. Transylvania is in fact a land of mountains and forests, folklore and tradition, hospitality and mystery, and to this day Transylvania remains Europe's best-kept secret. On a horse riding holiday in Transylvania you will discover traditional folk villages, where horses still plough the fields, and outnumber motor vehicles. Here the food is grown on small traditional farms, and rural tourism benefits ordinary people (not multinational corporations). The tranquility will inspire you – and harp back to a time before the hustle and bustle of modern day machines. Monasteries sit on quiet hillsides, and forests shelter an abundance of wildlife. At night bask in a star lit sky, without the glow of city light pollution. In Transylvania you will discover locals who are unaffected by the stresses of modern life, and welcome you to their little slice of heaven. Experience all this the same way the locals do, from the back of a horse! Hidden Trails has four horse riding holidays available in Transylvania. The Transylvanian Ride will introduce you to the forested hills made famous in the movie Cold Mountain – horse and man work together in the fields and country houses scatter the landscape. The Carpathian Mountains Ride takes in medieval villages and some of Europe’s oldest fortified churches. The History and Nature Ride will guide you through Central and Eastern Europe’s largest area of pristine nature – in the Carpathian Mountains. The Szekler and Saxon Land trips go deep into the hinterland where different ethnical groups made their home. On our Romania horse riding vacations we give you the opportunity to experience the rich and mysterious history of Transylvania, including the medieval Saxon citadel town of Sighisoara, the Byzantine Painted Monasteries, fine Austro-Hungarian architecture, and Roman remains. Transylvania is also the land of Bram Stoker's Dracula. We can take you to the Borgo Pass by horse and carriage, where you can stay in "Hotel Castle Dracula". You could discover local legends, perhaps around a bonfire over a drink or two with the local people. The distant howling wolves will be authentic! Temperature averages are: April 11°C; May 16°C; June 19°C; July 21°C; August 21°C; September 18°C; October 13°C. It may be about 5 degrees hotter at midday and 5 degrees colder at nightfall. Showers are possible at any time. The sun will be warm and bright in the clear mountain air. A Place of Great History & Myth..